Warning: This post contains graphic images that some readers may find distressing. A WOMAN ESCAPED serious injury after a swan flew through her windscreen while she was driving on the Cork to Limerick road. Mary Murphy was driving from Mallow to Cork at midday yesterday when the incident occurred. She told The Neil Prendeville Show on Red FM said was terrified by the ordeal. The car then veered into another lane. “Before I knew what hit me my whole windscreen was in and I didn’t know what it was at the time, but I knew it was a big, huge bird and it turned out to be swan that hit me. There was no warning at all … It was like a bomb going off. Murphy said the entire windscreen shattered and she “couldn’t see out at all” as her rear view mirror was also knocked off her Suzuki car. Other drivers allowed her to cross from the fast lane to the hard shoulder when she began beeping her horn and indicating. Murphy said the swan appeared to be disorientated. She added that the man who towed her car away said he has been in the business for years but has never seen a swan hit a car before. Email “PHOTOS: Swan flies through woman's windscreen 'like a bomb'”. 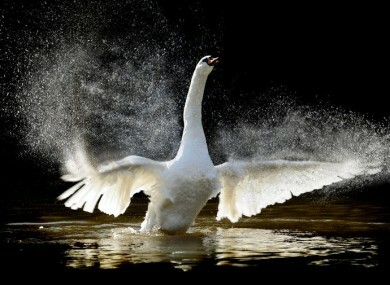 Feedback on “PHOTOS: Swan flies through woman's windscreen 'like a bomb'”.